Pressure washers are a type of equipment that is designed to clean a number of different things. A pressure washer is capable of cleaning buildings, concrete road surfaces, commercial vehicles, golf course equipment and much more. Visitors to a golf course expect not only the course to be impeccable, but they also expect the equipment to be clean. Power washers are the ideal solution to the cleaning demands of a busy golf course. You should no longer worry about keeping the golf course equipment spotless. Pressure washers are a one stop cleaning solution. The electric pressure washers that can be used to clean golf course equipment have an auto start and stop feature that is perfect for use at a golf course because now there is no longer any need of the operator of the pressure washer forgetting to turn off the pump. If the pump is left on then this can ruin the pump. All of the pressure washers that can be used to clean golf courts and golf course equipment are assembled and tested in the United States. A pressure washer is not only excellent at cleaning but there is free shipping on any model ordered. This allows you to solve all of your cleaning dilemmas while saving money. The automatic turn on and off feature automatically begins as soon as you press the spray trigger and once you let go, the spray turns off. This is one of the features that customers praise most about this type of pressure washer. 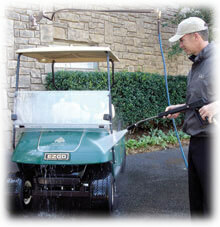 Power washers are excellent at efficiently and effectively washing golf carts. There are several different models of pressure washers to choose from when ordering. One type is the Direct Drive Electric Powered Unit. The features of the Direct Drive Electric Powered Unit is the 2 HP electric motor, 1500 PSI at 2.0 GPM, the five year warranty on the Triplex Plunger General Pump, the auto start and auto stop feature, the thermo-sensor, adjustable pressure, chemical injection, the trigger gun and wand, the aircraft grade aluminum frame and direct drive. There are other models you might want to look into as well. The Belt Drive Electric Powered Unit is a powerful pressure washer that has 2000 and 3000 PSI at 4.0 GPM, 5 to 7.5 HP Electric Motor, Triplex Plunger General Pump, auto start and auto stop feature, fifty mesh inlet water filter, a thermo-sensor, dual spring cushioned shock absorbing feet, chemical injection, adjustable pressure, complete control assembly with Mag Starter. Trigger gun and wand, belt drive and much more. Handle all of you golf cart and golf course equipment cleaning needs. Purchase a pressure washer and see results right away after the first cleaner. Pressure washers are the best way to clean golf carts and so much more. Thousands of satisfied customers are not wrong in choosing a pressure washer to handle even the toughest of cleaning applications.